Poe's parents, David Poe Jr. and Elizabeth Arnold Hopkins, were touring actors; both died before he was 3 years old. He was taken into the home of JohnAllan, a prosperous merchant in Richmond, Va., and baptized Edgar Allan Poe. His childhood was uneventful, although he studied for 5 years (1815-20) in England.In 1826 he entered the University of Virginia but stayed for only a year. Although a good student, he ran up large gambling debts that Allan refused to pay. Allan prevented his return to the university and broke off Poe's engagement to Sarah Elmira Royster, his Richmond sweetheart. Lacking any means of support, Poe enlisted in the army. He had, however, already written and printed (at his own expense) his first book, "Tamerlane and Other Poems" (1827), verses written in the manner of Byron. Temporarily reconciled, Allan secured Poe's release from the army and his appointment to West Point but refused to provide financial support. After 6 months Poe apparently contrived to be dismissed from West Point for disobedience of orders. His fellow cadets, however, contributed the funds for the publication of "Poems by Edgar A. Poe ... Second Edition" (1831), actually a third edition - after "Tamerlane" and "Al Aaraaf", "Tamerlane, and Minor Poems" (1829). This volume contained the famous "To Helen" and "Israfel", poems that show the restraint and the calculated musical effects of language that were to characterize his poetry. Poe next took up residence in Baltimore with his widowed aunt, Maria Clemm, and her daughter, Virginia, and turned to fiction as a way to support himself. In 1832 the Philadelphia Saturday Courier published five of his stories - all comic or satiric - and in 1833, "MS. Found in a Bottle" won a $50 prize given by the "Baltimore Saturday Visitor". Poe, his aunt, and Virginia moved to Richmond in 1835, and he became editor of the "Southern Literary Messenger" and married Virginia, who was not yet 14 years old. Poe published fiction, notably his most horrifying tale, Berenice, in the Messenger, but most of his contributions were serious, analytical, and critical reviews that earned him respect as a critic. He praised the young Dickens and a few other contemporaries but devoted most of his attention to devastating reviews of popular contemporary authors. His contributions undoubtedly increased the magazine's circulation, but they offended its owner, who also took exception to Poe's drinking. The January 1837 issue of the Messenger announced Poe's withdrawal as editor but also included the first installment of his long prose tale, "The Narrative of Arthur Gordon Pym", five of his reviews, and two of his poems. This was to be the paradoxical pattern for Poe's career: success as an artist and editor but failure to satisfy his employers and to secure a livelihood. First in New York City (1837), then in Philadelphia (1838-44), and again in New York (1844-49), Poe sought to establish himself as a force in literary journalism, but with only moderate success. He did succeed, however, in formulating influential literary theories and in demonstrating mastery of the forms he favored - highly musical poems and short prose narratives. Both forms, he argued, should aim at "a certain unique or single effect". 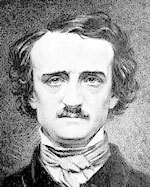 His theory of short fiction is best exemplified in "Ligeia" (1838), the tale Poe considered his finest, and "The Fall Of The House Of Usher" (1839), which was to become one of his most famous stories. "The Murders in the Rue Morgue" (1841) is sometimes considered the first detective story. Exemplary among his musical, mellifluous verses are "The Raven" (1845) and "The Bells" (1849). Virginia's death in January 1847 was a heavy blow, but Poe continued to write and lecture. In the summer of 1849 he revisited Richmond, lectured, and was accepted anew by the fiancee he had lost in 1826. After his return north he was found unconscious on a Baltimore street. In a brief obituary the Baltimore Clipper reported that Poe had died of "congestion of the brain."